Celanova is in Ourense province in the south of Galicia. It is perhaps somewhere to visit if you decide to spend a day or two based in Ourense and want to take a look at some of the provinces towns and monuments. 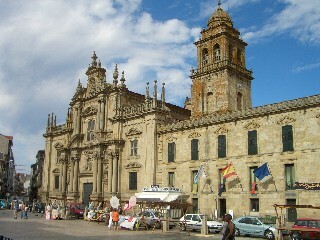 You reach Celanova on from the OU-540 from Ourense city and the town has a population of around 3000 people. It is quite close to Portugal as the crow flies. 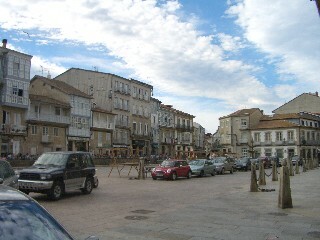 Right, the main square or plaza in the old town. Celanova is nothing special in itself. It sits perched on the down slope of a hill and has no extensive medieval area to speak of, but what it does possess is one of the largest and grandest monasteries in Galicia, if not the whole of Spain. 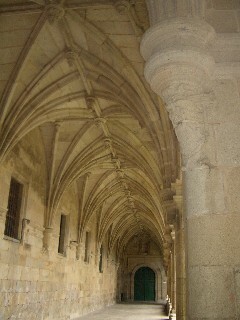 The monastery of Celanova is huge and it is called the Monasterio de Salvador. You see it as soon as the town comes into view and its monumental scale and detailed masonry more than justify a visit. The monastery also benefits from its aspect which, whilst visible on one facade from the hillside road opposite the town, faces the main town plaza on the other. 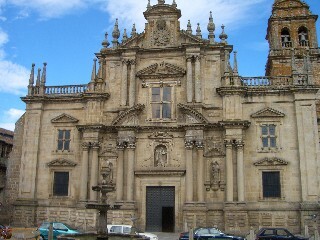 Left, this is the most impressive part of the main facade of the monastery. Getting information about the monastery proved difficult. The tourist office is actually located in the monastery, but their assistance was limited to say the least, they simply had nothing to give to tourists other than a small map of the overall locality. Once at the monastery you can enter the building's large and awe inspiring cloisters as well as admire the main façade from the opposing town square. If you enter the monastery cloister and look through across the small gardened courtyard, the intricate masonry detailing on the opposite upper levels is nothing short of exquisite and I defy anyone to cite a better example. The various gargoyle like head details are all of different beasts and the arches, columns and window heads are majestic. Right, some of the stone ceiling vaulting inside the monastery. 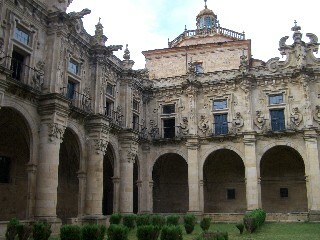 Externally, the monastery appears to be in sections with the most impressive been the building containing the monastic church (the Capilla de San Miguel). The photographs will show you all you need to know about the buildings grandeur and detail, but do not manage to convey the sheer scale of this monumental structure. A large tower also protrudes from the central section of the monastery and when you think that the building has come to an end, it simply steps back a few metres and then continues with a different façade. The main town plaza is also quite attractive and the parade of buildings facing the monastery comprise mainly of bars and cafes, all with chairs and tables in front of them on a slightly elevated walkway. Left, this is a view from within the monastery of a courtyard within the building. On the downside, it was disappointing that a collection of market stalls seemed able to open up shop directly against the monastery's main walls, but in their defence these photos were taken on 29 July 2006 on the evening of a large and very popular Celtic festival in the town. We therefore assume that this was an unusual occurrence. If you do visit Celanova do so in daylight hours. Firstly to appreciate the full spectacle of the monastery and secondly as it will make driving back to your base a less troublesome task. Other tourist attractions of interest and close to Celanova include the Castromao, the ruins of an old Celtic settlement and the town of Vilanova dos Infantes, a mere 10 minutes from the center of Celanova. This small town has, at its center, one of four identical and significant stone towers that are strategically positioned in this part of Ourense. Right, another shot of the main facade.